5-inch Samsung Galaxy J3 coming soon as a new affordable Android smartphone? Last month, Samsung unveiled the Galaxy J2 (pictured on the left) in India, and it looks like now it's getting ready to introduce another member of the Galaxy J series: the J3. Recently benchmarked over at GFXBench and Geekbench, the Galaxy J3 (model number SM-J3109) seems to be larger, and more advanced than the J2. Apparently, the upcoming handset sports a 5-inch display with 720 x 1280 pixels - a clear improvement over the 4.7-inch, 540 x 960 pixels screen of the J2. The new handset also seems to feature an 8 MP rear camera, a 5 MP front-facing camera, 1 GB of RAM, and 8 GB of expandable internal memory. As for the processor that's powering the J3, this is a quad-core, 64-bit Qualcomm Snapdragon 410 clocked at 1.2 GHz. 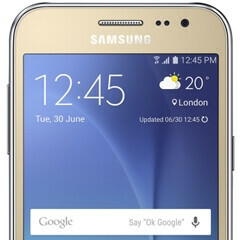 At the moment, the Samsung Galaxy J3 runs Android 5.1.1. We don't know where, and neither when the new smartphone will be available to buy, though it's probably safe to assume that it's going to be affordable. In any case, Samsung's Galaxy J series is slowly but surely growing: the J3 will be the family's fifth member, after the Galaxy J1, Galaxy J2, Galaxy J5, and Galaxy J7. Samsung has offered too many affordable options that affordable is becoming too cheap. Pun intended. Really? Whats gona be the price? I gues around 350$ no? the asus zenfone 2 laser is the clear winner here. I honestly do not get Samsung. It's amazing how they can release so many models. Why not only have 4 models/phones (a Note series, a flagship, a mid-range, and a low-range) and support them really well? I guess the people in the R&D depts at Samsung must be very convincing. Different Phones for different Markets. Even in their Flagship phones there are a ton of different models. But I don't get it either. Didn't Samsung say they were going to be making less devices this year? Not sure of the total count but it seems like a new device is either rumored or revealed every week. anything affordable android is in the back burner for software upgrades. These are probably recycled old phones.